JBL Celebrating Music Festival on Amazon You Can Win Assured Gift On Select Products. This offer from JBL on Amazon is applicable for all purchases made between Offer Dates. 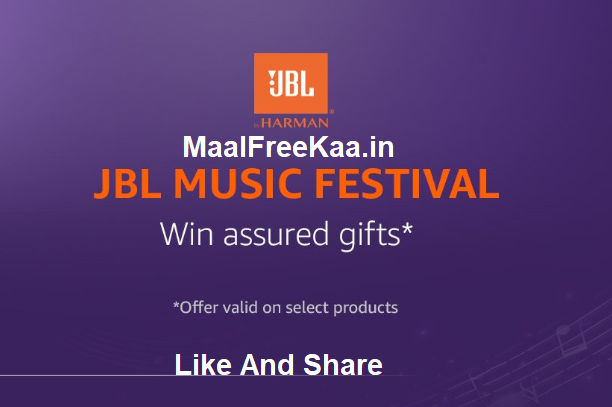 To avail the offer, you must have purchased original JBL product. MaalFreeKaa.in No. 1 In Online Contest, Free Giveaway, Free Sample, Freebie Deal website providing you better freebie prize and online competition also you find all Football World Cup 2018 Like FIFA Football Contest and much more you win daily when you visit daily our website now today we are shared biggest contest of football world cup. This voucher entitles the end user to redeem any one of following “2 Free Cappuccino or 2 Months Gaana Subscription or Rs.150 Zomato GV or Rs. 150 Movie GV by Paytm”. After 15 days from the date of purchase, please visit here enter the voucher code/order ID, fill up the form and click Submit. You will receive an Email /SMS with the Authentication Number. Click on the Booking Tab, enter the Authentication Number, fill up the required details. You will receive your coffee code within 24 business hours on their registered mobile no. To avail the offer, flash the coffee codes received via SMS at the participating venue prior to billing. You will receive the promo code & gaana.com web link details via Email & SMS within 24 business hours. Visit the Gaana.com App to redeem the offer. You will receive the Zomato code via SMS & redemption details via Email within 24 business hours. Visit Zomato App and use the code as per instructions sent via email. You will receive the movie discount promo code via SMS & partner redemption details via Email within 24 business hours.